by Peter MacKinnon University of Toronto Press 2018/$24.95/168 pp. Retired university presidents usually fade away, deservedly escaping controversy and the spotlight which so often envelop them in their taxing administrative roles. Not Peter MacKinnon, former president of the University of Saskatchewan. This book, his second treatise on university governance, rings alarm bells about the direction of Canadian higher education, particularly with respect to the meaning and exercise of academic freedom, an issue which has preoccupied North American campuses—and media critics—in recent years. 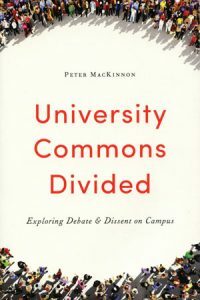 MacKinnon argues that universities thrive on difference—vigorous debate, after all, is their raison d’être—but they are dangerously divided around constituents’ understanding of the appropriate limits on free expression. He employs a case study approach, tackling high profile controversies, including those of University of British Columbia’s Steven Galloway, who was fired following accusations of sexual misconduct; University of Toronto’s Jordan Peterson, the anti gender-neutral pronoun warrior; and Dalhousie’s disciplining of dentistry students who posted vile misogynist messages on Facebook. He devotes considerable space to the fierce debate around Trinity Western University’s proposed law school, denounced by legal educators in several provinces because of the university’s anti-homosexual behavioural code. The case found its way to the Supreme Court of Canada which determined in June that religious freedom does not trump anti-discrimination protocols. The author’s view of how these and other episodes should be handled flows from a set of principles that he asserts ought to inform discourse in the university “commons.” Academic freedom, he submits, applies to the realms of teaching and research, but when professors take on administrative roles, such as serving on boards of governors, they must be governed by confidentiality rules. When academics pronounce publicly on issues unrelated to their scholarly work, they are exercising freedom of speech, not academic freedom, and the distinction between these concepts requires deeper appreciation, on and off campus. Efforts should be made, where possible, to resolve conflicts through dialogue and reconciliation without litigation in which entrenched positions only harden. Rather than expelling dental students who would have taken the university to court, Dalhousie’s president insisted on a “restorative justice” approach in which female victims spoke directly, and apparently effectively, to male perpetrators, who did not lose their academic year. MacKinnon applauds this outcome. MacKinnon also recommends a new national commission to study university governance, which has remained largely unrevised since at least the 1960s. The current “bicameral” model, through which lay boards of governors and academic senates (theoretically) share authority, is arguably obsolete in the face of unionization and other bureaucratic forces. Though marred by some editorial lapses—Laurentian University mysteriously becomes Lakehead University between pages 48 and 51—this book is a worthwhile contribution, and the author deserves credit for writing frankly and provocatively. No longer a university president, he is free to do so. —Paul Axelrod is former dean of education at York University.